Toffee Vodka, Skittles Vodka, ANYTHING Vodka! I was browsing through some forums today when something absolutely brilliant grabbed my attention. It was a thread somebody had created about Toffee Vodka and how to make it, so I thought I would share this party making topic with you! It really is simple. Toffe Vodka: Simply buy a cheap bottle of Vodka and pour a large pack of Werthers Originals in. You may need to drink some of the Vodka first to stop overflowing though. The toffee's will take approximately 2-3 hours to fully dissolve but once this has happened you should store in the freezer until ready to consume. Vodka does not freeze and therefore the beverage will be ice cold when you are ready to drink it. 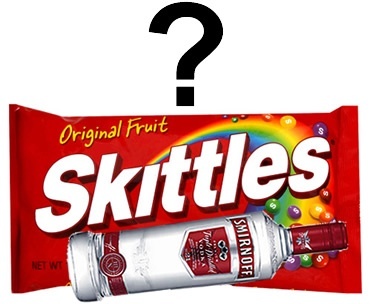 Skittles Vodka: Buy 2 bags of Skittles and take the green skittles out. Pour into your Vodka and leave to dissolve for a couple of hours. Mars Vodka: As above but with Mars bars (use 1-5 depending on thickness required). Creme Egg Vodka: As above with a pack of Mini Creme Eggs or a couple of original Creme Eggs. Anything You Want Vodka: As you can see, it appears that any type of sweets/chocolate can be used to make an array of different party Vodka. Have a go, try some of your favourite sweets and let me know what you came up with and the outcome! Happy drinking!